Oregon Gov. 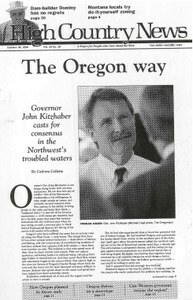 John Kitzhaber, D, is determined to solve difficult problems - such as the recovery of his state's wild coastal coho salmon - at the state level, through consensus. Former Sen. Ted Hallock recalls his 20 years in the Oregon Senate, particularly his work to pass his state's nationally recognized land-use planning law, a quarter-century ago. There are vast differences between the two faces of Oregon, its rural and urban, coastal and inland cultures and economics. Statistics about Oregon, including per capita income, unemployment rate, estimated number of salmon in the northern coastal range, etc. Are the West's governors turning over a new (green)leaf? The Western Governors' Assn. recently agreed unanimously on a "shared environmental doctrine," giving the federal and state governments shared responsibility for environmental protection - but some critics say it's just another push for states' rights. Former Bureau of Reclamation Commissioner Floyd E. Dominy, looks back on his dam-building days without any apologies or regrets. A documentary called "Varmints" explores the controversy over prairie dogs, between environmentalists who see them as essential parts of prairie ecosystems and others who see them as oversized rats, good only for shooting. A book review of "100 Classic Hikes in Washington" by Ira Spring and Harvey Manning. The Sierra Club's report, "The Dark Side of the American Dream: The Costs and Consequences of Suburban Sprawl," neglected to cover many sprawling Western cities, such as Salt Lake City. An exhibit gathers photographs that Mabel Souther, a ranch manager's wife, took a hundred years ago on the Big Red Ranch in northeastern Wyoming. A series of newspaper articles from the Seattle Times scrutinizes recent land trades in the West. Picuris Pueblo potters fear that expansion of a privately owned mica mine near Penasco, N.M., will use up the last-known micaceous clay, which they use in their traditional pottery. The deadline for public comments on a plan to manage Yellowstone's wandering bison has been extended to Nov. 2. The Colorado Geological Survey's new quarterly newsletter, "Rock Talk," is geared toward the general reader. The Northwest Mining Assn. 's 104th annual meeting, "Exploring New Opportunities," features Alaska Sen. Frank Murkowski, R, Nov. 29-Dec. 4 in Spokane, Wash.
Colorado environmentalists halt two roadless-area timber sales, the Trout Mountain sale in the Rio Grande National Forest and the Sheep Flats sale in the Grand Mesa National Forest. Are birds to blame for vanishing salmon? On Rice Island at the mouth of the Columbia River near Astoria, Ore., the world's largest nesting colony of Caspian terns enthralls birders but worries others, who claim the birds are eating too many endangered salmon and steelhead smolts. Alaska Rep. Don Young, R, won't get his list of environmentally inclined Forest Service staffers; giant omnibus public-lands bill is defeated; Montana fines Canyon Resources Corp. for polluting streams; Hanford "downwinders" lawsuit is dismissed. In Montana's Park County, locals worried about runaway growth create the West Boulder Zoning District, despite some landowners' accusations of "land-use dictatorship." Plans for building the Buffalo Ranch development - one of Montana's "most exclusive and expensive subdivisions" - have many Paradise Valley residents worried. Washington voters will decide between two women candidates for the Senate - incumbent Patty Murray, D, and Linda Smith, R; Green Party candidate Sam Hitt challenges incumbent Ray Powell, D, for New Mexico state lands commissioner. Would-be water baron Gary Boyce has locals worried about his plans to pump water from under his huge Baca Grande Ranch in Colorado's San Luis Valley and sell it to thirsty Front Range cities. Former Curry County, Ore., commissioner Peg Reagan has founded a grassroots group, the Conservation Leaders Network, to work on environmental issues and break the connection between county coffers and federal timber contracts. Arizona orders copper companies to clean up mining contamination near the small towns of Globe and Miami.